Dr.Prabhu completed his MBBS in Govt. Stanley Medical College (Dr.MGR Medical University) Chennai in 2003. Immediately after that he joined M.S., (Gen.) in 2004 in Madras Medical College, Govt. General Hospital, Chennai. Then he did his M.Ch (Neuro Surgery) in one of the most reputed and pioneer Institute, Madras Institute of Neurology in Madras Medical College from 2010 to 2013. He is very much interested in Brain & Spine surgeries. So after completion of his M.S.,(GEN. ), he joined as an Assistant to one of the most renowned and leading Neuro Surgeon PROF.K.R.SURESH BAPU for around 3 years from June 2007 to January 2010 in St. Isabel Hospital. 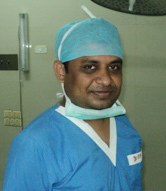 During that period he learnt micro neurosurgical techniques and minimally invasive spine surgeries. After completion of M.Ch Neuro surgery he worked as Assistant Professor in Madras Institute of Neurology for 6 months. Now he has joined as a Consultant Neuro Surgeon in KMCH Erode Center. Neuro oncologic surgeries using Micro Neuro surgery principles. A rare cause of lumbar radiculopathy e-journal, Tamilnadu Dr.MGR Medical University. Analyzed the multiple factors influencing the outcome in severe head injury patients with GCS ≤ 8 in the period of 3 years(2010-2013). Abdominal compartment syndrome –an outcome based analytical study.